This article is a step by step breakdown on how to set dates in pick up and return step to be the booking dates respectively. In doing this, the pickup and return dates will be what the dates are in Step 1 of the reservation. To learn more about the steps of a reservation, click on this link here. 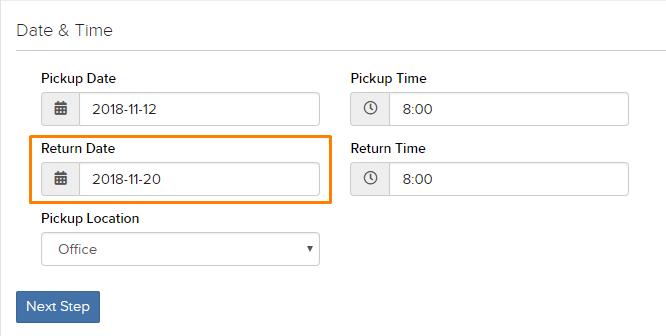 Here, select “Yes” under “Set the Pickup Date in Pickup Step to the Pickup Date of the Booking” as shown in the picture below highlighted in orange. Now when you reach Step 7 (Pickup Step), the date on that step will be the date from Step 1. The picture above shows the date of the booking while the picture below shows the pickup date. Now when you reach Step 9 (Return Step), the date on that step will be the date from Step 1. The picture above shows the date of the booking while the picture below shows the return date.